If it is the ludyx toolchain youbare talking about I have developed many complex projects using it. Including a pretty comprehensive 2D platformer game engine. At least you got lucky, it was unable to build a null version of doom that would even attempt to execute. The GCC port is modified to use the HAS assembler, which at least produces stuff that'll run. I always ran into problems eventually. Even Soldam, which is 99% assembly, stopped working eventually under lydux toolchain. I don’t think running something as comprehensive as doom is a good benchmark for that toolset. It is perfectly fine for doing your own projects from scratch. Porting code from other platforms, not so much. There isn't a whole lot of information out there on exactly how the X68000 formats it's graphical data (or at least not any information that I could find), so any tips (or possibly even utilities) would be highly appreciated. I've attached my data file below in case you want to examine it. Note that I didn't create a palette for it, so it would theoretically use palette colors #61 (a dark teal-ish color by default) and #FF (a very-slightly-greenish white by default). 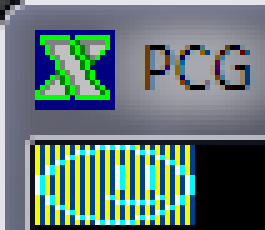 PCG is 4-bit 1-dimensional packed into 8-bits. So you have 4-bit pixels where rows are stored sequentially in RAM. that is to say, two 4-bit pixels for each 8-bits. The high nibble is the left pixel, the low nibble is the right pixel. Thanks for the clarification, neko! My advice; grab a copy of the PUNI docs and a copy of Inside X68000. Nearly everything is covered at least a little in the PUNI docs and anything missing or in need of detail is almost certainly in Inside X68000. There is also some info on the wiki in English but it's pretty incomplete.